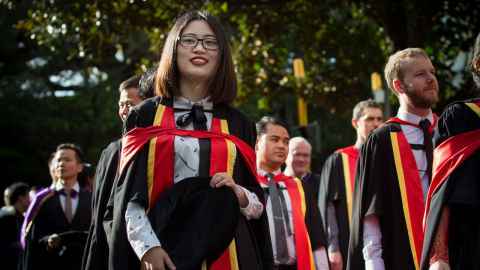 The gown for higher doctoral degrees is the same as the Cambridge Master of Arts, but made of black silk or scarlet silk or cloth. The gown is the same as for the Cambridge Master of Arts with the addition of scarlet facings edged with gold satin. The hood is made wholly of scarlet silk. The gowns for the following doctoral degrees are the same as the Cambridge Master of Arts, faced with satin with the same colour as their hoods. Doctor of Pharmacy Grey green.